As I mentioned often, we have quite a lot of churches in Lübeck, and other old architecture. As I mentioned too, I am not very religious, but I am still interested in architecture, especially old structures including churches. The church in the photo is called St. Jakobi church and was built in the year 1334. The church has the title “church of the seafarers” since the medieval. 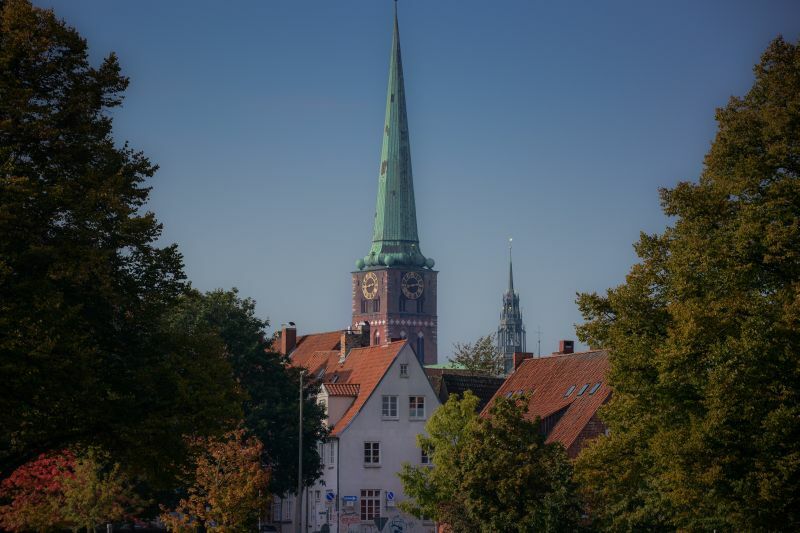 Many churches of Lübeck were totally destroyed during the second world war, and most of them had to be reconstructed or repaired afterward, but the St. Jakobi church was not damaged during the bombing of the city. I shot the photo this year by the end of the summer when I was hiking near the Trave River close to the historic district of Lübeck. You are very fortunate to live in a city where so much of its medieval past remains. I really forgot that for a while, until I started with photography. You probably know this feeling,.. things are not very special when you can see them everyday in your city. But today I value this more again. However, what I dislike is that some “insane” city architects started to build very modern buildings near some of our old architecture, for example near the old market place… 😀 Many people were upset because it doesn’t fit to the nearby old buildings. 😀 I might take a photo some day to show you how some things don’t fit anymore. Yeah, nothing to say against modern architecture, I like it pretty much, but architects should take a closer look at the enviroment, and if it fits to the surrounding buildings. I believe we have a lot of building that they can not demolish because they are UNESCO world heritage protected, but still there might be buildings nearby with the same look, but not the same importance, that they will modernize once there is no tenant anymore, and that destroys the overall look of the city. I would stand in front of a bulldozer if they would want to demolish extremely old architecture like the Holsten Gate, or the Churches and so. I have read, Lübeck lost a lot of it’s charm over the last century, because they demolished and modernized things, fortunately many important building are protected today. It’s still sad to look at very old pictures, and to know that the stuff simply doesn’t excist anymore.